I went to see Rob Zombie’s remake of John Carpenter’s HALLOWEEN with fairly low expectations, but was completely amazed at the bland, unfrightening misfire I experienced. It’s almost as if the filmmakers decided, “I know! Let’s remake one of the most iconic, groundbreaking horror films of all time and take out all the scary stuff!” Yes, the long backstory (which shows Michael Myers’ bad childhood) is utterly superfluous. 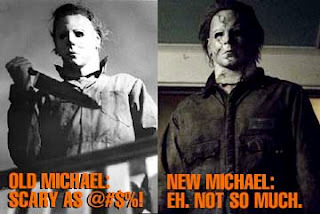 Not only does it remove all of the mystery from the character, but why make Michael sympathetic if you’re going to continue to show him as an utter psychopath? Also, switching most of the climactic action from the mundane suburban home of the original to the spooky, decrepit abandoned Myers home makes the terror less relatable to the audience. The whole film is over-designed (the more intricate mask is not nearly as scary as the simple original). But the movie’s remarkable lack of suspense is its worst affront. To wit, one of the most horrifying scenes from the original is the one in which Laurie (Jamie Lee Curtis), after discovering the dead bodies in the house across the street and being attacked by Michael, runs back to the home in which she’s babysitting and bangs frantically on the locked front door for Tommy to open it. The camera cuts from Laurie to the view over her shoulder of Michael leisurely walking across the street, knife in hand, while Tommy, asleep upstairs, slooooooowly awakens and agrees to come down and let his babysitter in… it’s a beautifully agonizing scene, but in the remake, after Laurie discovers the bodies, she runs back across the street and bangs on the door…. But there’s NOT ONE SHOT OF MICHAEL FOLLOWING AFTER HER!! What makes it so mind blowing is that writer / director Rob Zombie is an avowed acolyte of the genre, the film and the film’s auteur, John Carpenter. Is it possible that he simply doesn’t understand the elements that made 1978’s HALLOWEEN so terrifying and successful? It is possible that, based on nothing more than Zombie’s tattoos, the concept of “Less is More” is a foreign aesthetic to him. So I stabbed them in the necks with knitting needles (Good thing I always knit at the movies). rare is the remake that improves on the original. Actually, John Carpenter is one of the few to do so with his reinterpretation of "The Thing". I haven't seen Zombie's "Halloween", and as a huge fan of the original I'm sure I'll agree with your take. Zombie knows how to make a movie. "The Devil's Rejects" is a very solid (if thoroughly unpleasant) piece of work. Better he should just be an auteur and make his own stuff.